Celtic harp performer is available for historic or cultural events, weddings, therapy in Wisconsin, Illinois, Michigan, Minnesota, Iowa. I do a variety of performances, both background and center stage, quiet mood or story telling, with a historical background. I am constantly researching historic music, harpers, and instruments of the Celtic people. I perform at: weddings, folk fests, concerts, renaissance fairs, historic reenactments, restaurants, private parties, dinners, civic events, art shows, antique shows, funerals, etc. Clothing: I can dress in modern elegant or casual, or in historical clothing ranging from medieval Scottish to 18th century Irish and Irish-American. This is at your discretion. Therapeutic Harp: As a former therapist, I have utilized harp in group therapy settings with highly successful results. 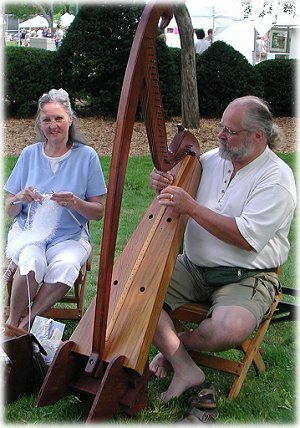 In the mental illness area, the harp has been effective in calming and promoting an attitude of working together. Recently, I have been researching the effects of live harp music on oncology patients, particularly with chemotherapy. Documentation shows that live harp music reduces nausea at an amazing rate. Pain is markedly reduced, as well as anxiety. It also promotes an overall positive attitude and a sense of well being. Hospice: Harp can help bring a peaceful closure in the event of a dying family member. Location: Fox Cities, Appleton, Oshkosh, Green Bay, Outagamie County resident, Winnebago, Brown, Calumet, Waupaca, Shawano, Oconto, Fond du lac, any county in Wisconsin. Will travel throughout Wisconsin and into Michigan, Illinois, Iowa, Minnesota.